Earlier today, the official website of Target was updated to include a new listing for a PlayStation 4 Elite Controller. According to its description, the wireless controller is going to release on November 1 for the cost of $79.99. Unfortunately, there’s no mention of the manufacturer. This leaves us speculating whether the peripheral is from Sony or a third-party vendor. That being said, the images of the controller reveal no PlayStation logo anywhere on the front or back. 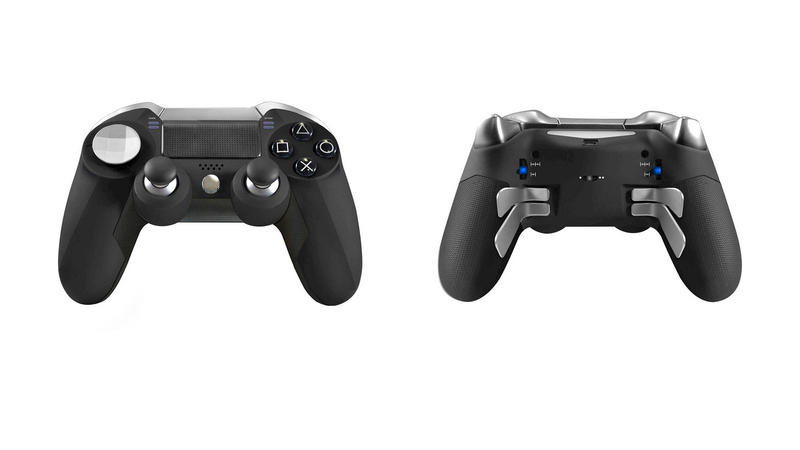 The PlayStation 4 Elite Controller promises to offer “the most comfortable, customizable gaming experience possible.” It weighs in at approximately a pound and boasts the following dimensions: 5.50 inches (L) x 8.00 inches (W) x 3.50 inches (D). Owners can expect superior Rubber Grips, Dual Analog Sticks, Built-in Rechargeable Battery, Multi-touch, Padded, Reverse Analog Sticks, Throttle Control, and Transforming D-Pad. Preset 2: paddles emulate RB, LB, RT, and LT.
It’s important to note that the listing specifically mentions “RB, LB, RT, and LT.” Those are primarily used by Xbox controllers. The PlayStation’s Dualshock uses R1/R2 and L1/L2. Was this simply an error on the poster’s part or the PlayStation 4 Elite Controller is simply a prank? Sony is scheduled to host its exclusive PlayStation Meeting tomorrow to unveil PlayStation Neo and PlayStation 4 Slim Edition. If this Elite Controller is legitimate, we should hear about it tomorrow.